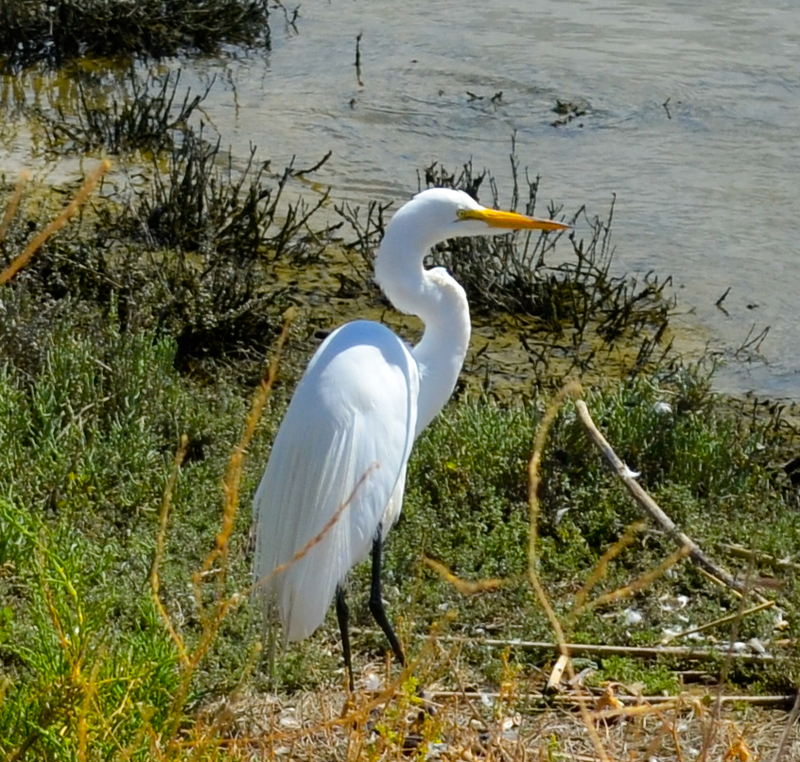 Day 19: Socialization – The San Francisco Bay Trail: It's Closer Than You Think! The birds down here are more socialized – or should I say humanized – than their counterparts in some of the more isolated locales along our shores. They are not quite as timid, one might even say they are friendly – with the exception of the Canada Geese. Canada Geese are nothing like Canada Humans by the way. I have never met a Canada Human who hissed at me every time I walked within ten feet of them. In fact I worked for some Canada Humans once and they were all-around nice and courteous people. So I am not sure where the geese picked up such an attitude. In all fairness, I know the answer – they’re warning me away from their young, which, at this point, are not much smaller than their parents. When I walked past an unattended adolescent Canada Goose today while “surveying some privately held acres of land for sale” between sections of Bay Trail, I was especially wary of my surroundings. I was wondering where mother goose was and when she would bear down on me with her massive beak ready to wreak havoc on my day. Really, I was really nervous. This might explain the lack of coyotes along Coyote Creek – over sized Canada Geese with over-sized egos are scaring all the coyotes away. For the record, the Bay Trail has been approved to cross that aforementioned section of land. All they need now is, yes you guessed it: money. Let me know if you need to know where to send the check. The avians not of the Canada Geese variety in these more populated locales seem to permit my presence more so than those in more isolated areas such as the northern edge of San Pablo Bay. That is the only sensible logic behind me being able to get close enough to a Great Egret to catch an image of one worth sharing with you. Birders, please hold off on the hate mail. I did not stalk this bird or creep up close enough to bother him in the least bit. I merely saw him in passing as I walked along a raised levee and he could care less I was there. I captured the image with my standard Nikon DX 18-55 zoom lens, long ago having realized that my cheap 70-300 zoom is worth every penny I paid for it. The white pelicans were once again abundant but kept their distance, preferring to socialize in groups a few hundred yards from the trail. On occasion some would pair off and I would find them down trail a bit enjoying a lovers’ picnic while simultaneously lowering their heads into the water and fueling up. The white pelicans, as it turns out, have quite a population along the east bay south of Highway 92. I saw none, zero, zilch, north of 92, not even along the desolate Hayward shoreline. However, just as Ann at the Hayward Shoreline Interpretive Center said a few days ago, “You just might see some white pelicans down there”. Today was a short hike. When walking ten to twelve miles daily I need to throw in a few shorties every now and then to allow the blister (that’s right, just one) to heal a little and let the body work out the strange aches and pains that come to the surface before hiding out again for a few days. After 200 miles I am noticing more and more mystery pains but today’s hike will be followed by the ultimate cure-all for any malady: In-N-Out Burger. In college we would drive forty five minutes to the closest In-N-Out Burger in Arroyo Grande – now I only had to walk for two and a half hours to get there. I missed my bus by thirty seconds as a result and it was well worth it as I savored every morsel while waiting for the next bus which came right on time thirty minutes later.